Lindsey Buscher, assistant research editor with the History of Cartography Project at the University of Wisconsin–Madison and managing editor of Science Editor, is mapping her course through the wilds of technical publishing and credits CSE as a primary navigation tool. Lindsey began her adventure at the University of Kansas, earning a bachelor’s degree in English with a minor in Italian. On becoming one of the first graduates of the newly developed Technical Communications Certificate Program at the University of Kansas, she knew that she wanted to go into publishing, and she found an opening as an assistant managing editor at Allen Press in Lawrence, Kansas. Not long after, Lindsey was promoted to managing editor. She also passed the Board of Editors in the Life Sciences examination in 2010. While at Allen Press, Lindsey learned about CSE. She joined the Publications Committee and the Membership Committee. 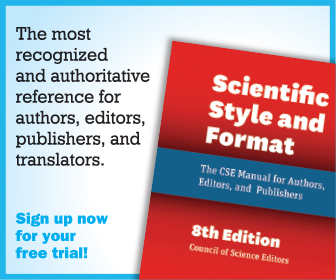 In 2011, CSE began accepting applications for project manager of the eighth edition of the style manual, Scientific Style and Format. Lindsey was hired and worked on the style manual (while still full-time with Allen Press) for three years until the manual was published in May 2014. Within a week of the style manual’s release, Lindsey and her husband had a baby boy; three months later, the family relocated to Madison, Wisconsin. 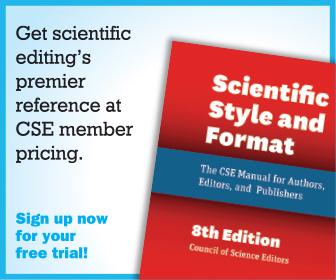 Around the same time, Lindsey learned about the newly created position of managing editor of Science Editor. It seemed like a perfect fit because she could work part-time from home and also stay involved with CSE. Almost a year later, she started looking for full-time work and happened upon an opening at the University of Wisconsin with the History of Cartography Project. Lindsey discovered that the University of Chicago Press had published the first four volumes of the project and would be doing the fifth as well. 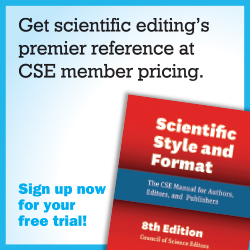 She had worked with the Press on the CSE style manual, so she made use of her network and applied for the position of assistant research editor. “Without question, I have CSE to thank for my current position,” she says. In this position, she factchecks all references and entries submitted to this encyclopedic volume. 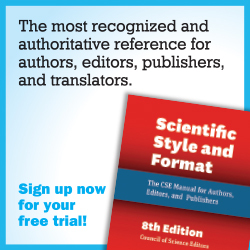 She also coordinates all editorial aspects, from submission through editing and translating. Lindsey enjoys learning about font history, typography, and typesetting and is currently reading Bringing Up Bébé: One American Mother Discovers the Wisdom of French Parenting, by Pamela Druckerman. “I’m (quite impatiently) waiting for new seasons of Sherlock and Game of Thrones,” she adds. Regardless of where her next adventures lie, it is clear that Lindsey will continue to use CSE and the network she has built as a compass to help guide the way.